Did you just hook up a DIRECTV Genie Mini Client only to find yourself staring at a grey screen? If so, just take a deep breath and relax. This is a small setback, and it’s one that Signal Connect can help you fix. By following these instructions, you or a member of your family will be able to enjoy DIRECTV in another room of your house. 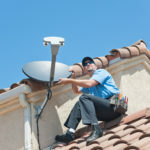 We’re all about helping you fix your DIRECTV connection issues so you can get back to enjoying these premium satellite TV service. To replace that grey screen with the programming you enjoy, just follow the easy steps we’ve listed here. Blinking Green: You client can’t connect to the other device. Reboot other things on the network. If the light doesn’t turn solid green after that, you might have problems with your cable or client. Solid Amber: This indicates a weak connection. The line is probably too long, or the cable or splitter is low quality. Replace them with DIRECTV-approved cables and splitters. Solid or Flashing Red: There is no connection. Check the wiring path to make sure everything is connected. If you have indicator light issues, it might also mean the cable. There’s an easy way to find out if this is the case. Bring another client into the room and hook it up in place of your new Genie Mini Client. If a client that worked in another room operates in this temporary hook up, then your new client is likely the problem. If the temporary client doesn’t work, chances are you have a problem with the cable. Did you use a DIRECTV-approved cable? If not, we recommend you do. Press the red button on the side of the client and wait five more minutes. In most cases, this is all it takes. Don’t be alarmed if you see a message on the TV that states the client update is loading. This is normal. Turn your client on and wait until it’s powered up. Press and hold the red reset button on the side for at least 30 seconds. When you do this, it wipes out all custom settings. If this doesn’t work, there might be a defect in the client, but it still might be worth repeating step two just to be sure. The steps we shared in this tutorial should fix about 99 percent of the issues that come with the first time you power up your Genie Mini Client. Once you have gotten past that grey screen, your system should be ready to allow you to enjoy your DIRECTV programming. DIRECTV produces quality satellite TV equipment, but sometimes things go wrong. Customers don’t set things up properly, or they use the wrong cables. This results in DIRECTV connection issues. (Black or grey screens, and Error 771 messages are among the most common.) What should a DIRECTV subscriber do when these things happen? Signal Connect has the answer! If you need DIRECTV technical support, call James Hampton, Signal Connect DIRECTV technical support specialist. His installation experience is so vast that he’s able to diagnose most issues over the phone. He’ll also walk you through the fix, and stay on the line to make sure your service returns. Best of all, this tech support is FREE to all DIRECTV customers. If you need help, just call 866-726-4182, or contact James directly. He’s always happy to help DIRECTV customers get the most from their satellite TV service. This entry was posted in AT&T/DIRECTV and tagged customer service, directv, Equipment, hd, high definition, installation, upgrade. Bookmark the permalink.